The first 100 active-duty troops of Operation Faithful Patriot had arrived at the U.S.-Mexican border at a port of entry in McAllen, Texas to provide support for Border Patrol agents. There are about 2,600 troops now at staging bases, largely in Texas. Several thousand more troops are expected to flow in through the weekend and move into California and Arizona. The Pentagon said more than 7,000 active-duty troops are being sent to the southern border, with more possible. President Trump said the number could reach 15,000, which is the equivalent of nearly an entire military division. A divisional unit in the U.S. Army typically consists of 17,000 to 21,000 soldiers. There are about 1.3 million active-duty service members in the U.S. armed forces. 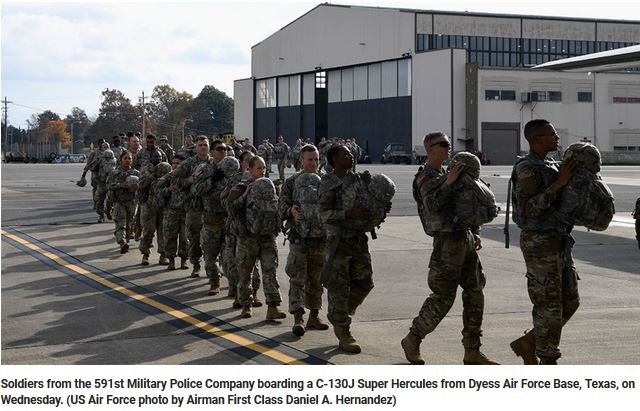 And as Air Force Gen. Terrence J. O’Shaughnessy, who as head of U.S. Northern Command is leading Operation Faithful Patriot, said in a press conference on October 29, the troops that are deployed to the border will be armed. Also yesterday, in a speech on immigration, President Trump, as Commander In Chief, gave the military mobilizing at the border permission to use lethal force. He said that if “migrants” try to throw rocks at soldiers, they should act as though the rocks are “rifles”. Trump also said he will sign an executive order sometime next week which would ban migrants from claiming asylum if they cross the border illegally. “Migrants” claiming political asylum would not be let into the U.S., but would be held in vast tent cities. Operation Faithful Patriot is set to last only 45 days. I am at the Hyatt Regency in Arlington Virginia at the conference but the Marine Corps is having its 243rd anniversary celebration in the same location. However the Marine Corps birthday is actually November 10th. I asked a few Marine officers why they’re celebrating on November 3rd are they deploying next week and I just got a few grins who knows? This entry was posted in Donald Trump, Honduras-Guatemala 'caravan' invasion, illegal immigration, Military, United States, US Presidents and tagged Air Force Gen. Terrence J. O’Shaughnessy, military vehicles to US-Mexico border, Operation Faithful Patriot. Bookmark the permalink. God Bless Our Troops! I am certainly glad that our President has taken this action. So, what happens in 45 days? They leave the tent cities and enter the US, right? AFter all, the election will be over. While I agree with both Auntie and Lophatt on most of their points, I think that low-fat is quite correct when she says that it would be a mistake to even let them into tent cities. it is my understanding that once they get their feet on the ground they automatically obtain certain benefits, and it becomes much more difficult to send them out of the country. And that is why they must NOT be allowed to in at all without processing. Stop all foreign aid to these countries immediately where these illegal criminal invaders are coming from, including Mexico. Stop all wire transfer of monies to these countries. Watch the American dollars dry up and things will change pretty quick. So racism is defined by not interfering when a POC commits a crime? So the army is going to pass out soccer balls and change diapers while making sure the tents are well stocked and comfy? My 101st Airborne Ranger father is somewhere in Southeast Asia wiping a tear from his eye. What??? I thought they would already have 1000+ there by now and have already setup their tents. This is not going to work out well if they are that slow. All i am really looking for now is some last minute thing the Marxists are going to put out in the media in the last 2 days before the election. Regardless of the troops “ waiting” at the border, I continue to be skeptical about the INVADING MERCENARIES not entering the country, otherwise tents will not be erected to house any potential policial refugees. Phooey, it’s all a game and my taxes will go up. Here’s where the rubber meets the road. Either we stand as a nation of laws whose first duty is the security of its own citizens or we become just another footnote in history. My hope is we remain the shining city in the hill and not the dilapidated ruins of what might have been. I also heard that a huge contingency of Venezuelan citizens are in the caravans. They are saying that the Pentagon is refusing to send troops. If this is true he should have all the generals heads on a platter in thirty minutes. It’s a great promotional opportunity for colonels.